Differentiating atypical parkinsonism from Parkinson’s disease can be a challenge in patients presenting with symptoms in early disease stages. A diagnosis cannot be made from a brain magnetic resonance imaging scan, but brain MRI can be of added value when there is uncertainty about the clinical diagnosis. The appropriateness of and the added diagnostic value of a brain MRI scan in the work-up of parkinsonism is described in a newly published article in the Journal of Parkinson’s Disease. Lead author Frederick J.A. Meijer, MD, PhD, a neuroradiologist in the department of radiology and nuclear medicine at Radboud University Medical Center in Nijmegen, The Netherlands, offers advice on the scanning protocol to use, and also discusses its diagnostic value with respect to specific abnormalities that can be seen. The authors of the article, who also include neurologists from the Radboud University Medical Center and Donders Institute for Brain, Cognition and Behavior, conducted a 3-year long prospective study on the contribution of routine brain MRI to the differential diagnosis of parkinsonism.1 Based on this research, the authors refuted clinical guidelines recommending standard use of cerebral MRI for all patients presenting with parkinsonism. At Radboud University Medical Center, patients presenting with classical symptoms of idiopathic Parkinson’s disease and with a satisfactory response to a normal dose of dopaminergic medication, do not have a brain MRI on a routine basis. However, this examination is routinely ordered for patients with an atypical disease course. The added value of brain MRI is greatest for patients with a possible underlying treatable cause of parkinsonism. These include patients who might have cerebrovascular pathology, or who are suspected of having normal pressure hydrocephalus. Specific abnormalities seen on a brain MRI can also suggest a specific form of neurodegenerative parkinsonism, such as multiple system atrophy (MSA) or progressive supranuclear palsy (PSP). The cortex, basal ganglia, brainstem and cerebellum are the main cerebral areas of interest in patients with specific forms of neurodegenerative parkinsonism. They explain that atrophy and T2 hyper-intensity changes of the pons and cerebellar peduncles are suggestive of the cerebellar form of multiple system atrophy. Both the parkinsonian and cerebellar forms of MSA may reveal atrophy and T2 hypo-intensity of the putamen. The combination of atrophy and severe hypo-intensity of the putamen on susceptibility weighted imaging or T2* can differentiate MSA from other forms of parkinsonism in both early and late disease states. Signs of PSP include atrophy of the midbrain and atrophy with signal intensity changes of the superior cerebellar peduncles. 3T brain MRI including DTI tractography in a patient presenting with parkinsonism. The authors recommend the use of a 3D FLAIR sequence for the evaluation of signal intensity changes of the thalamus, brainstem, and white matter lesions in vascular parkinsonism. Diffusion weighted imaging and diffusion tensor imaging may provide quantitative measures of the basal ganglia, brainstem and cerebellum, which could assist in the identification of both Parkinson’s disease and atypical parkinsonism. 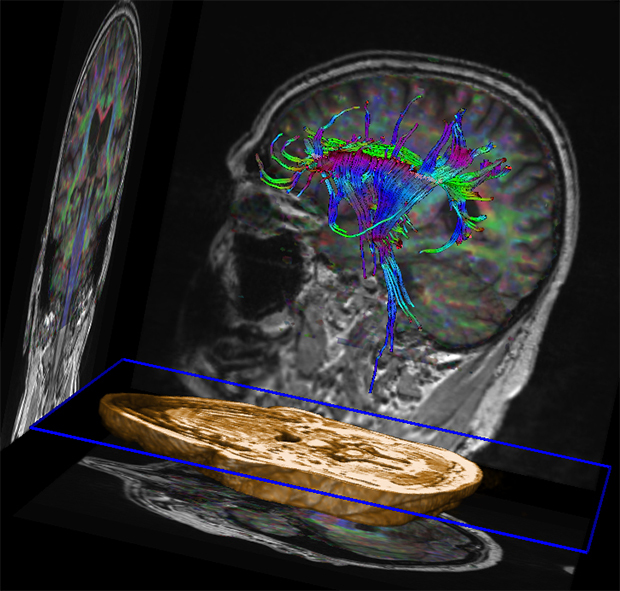 For clinical application of brain MRI in parkinsonism, the authors recommend a scanning protocol including 3D T1-weighted and T2 FLAIR sequences. They also recommend the acquisition of diffusion-weighted imaging and a susceptibility sensitive sequence (T2* or susceptibility weighted imaging). Meijer FJA, Aerts MB, Abdo WF, et al. Contribution of routine brain MRI to the differential diagnosis of parkinsonism: a 3-year prospective follow-up study. J Neurol. 2012 259: 5: 929-935. Meijer FJA, Goraj B, Bloem BR, et al. How I do it: Clinical Application of Brain MRI in the Diagnostic Work-up of Parkinsonism. J Parkinson’s Dis. Published online March 6, 2017. When brain MRI is recommended to help diagnose parkinsonism. Appl Radiol.